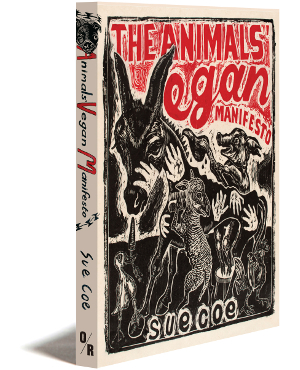 Sue Coe’s advocacy of animal rights is unmatched in its eloquence, forcefulness, and lasting impact. Now you can show your commitment to the cause of animal rights with this capacious, hard-wearing tote featuring an original illustration from The Animals’ Vegan Manifesto. Printed black on natural, 100% recycled cotton. Reverse side sports the OR logo.